Former CIA agents and the bestselling authors of Spy the Lie, Philip Houston, Mike Floyd and Susan Carnicero are among the world’s best at recognising deceptive behaviour and drawing out the truth from even the most accomplished liars. 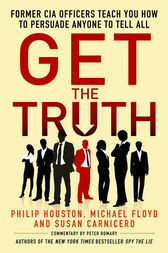 Using techniques developed in real-life counterterrorism and criminal investigations, in Get the Truth they present a step-by-step guide that empowers readers to elicit the truth from others – whether that’s in the boardroom, the classroom, or our own homes. Using thrilling anecdotes from their careers in counterintelligence, and with easy-to-follow instructions, the authors provide a foolproof means of getting absolutely anybody to give an honest answer.Get the Truth is the easy and effective way to learn how to get to the truth every time. PHILIP HOUSTON's twenty-five-year career with the CIA included thousands of interviews and interrogations for the CIA and other federal agencies, both as an investigator and as a polygraph examiner. He, along with former CIA agents MIKE FLOYD and SUSAN CARNICERO, founded Qverity, a provider of behavioral analysis and screening services for private- and public-sector clients worldwide. Houston is also the author of Spy the Lie.